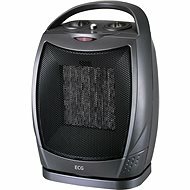 This electric heater offers its user a trouble-free and maintenance-free operation and a stylish appearance with rounded edges in black, which nicely complements any interior. It is ideal for any places where the only sources of heat are electric. 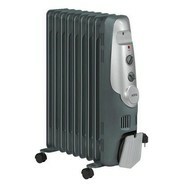 It is also suitable for extra heating of little-heated rooms at home or in the office. 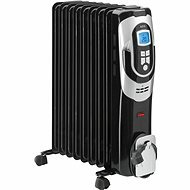 The 7 heating elements and a maximum heating power of 1500W take care of the efficient heating of rooms up to 20m2, so that you can enjoy a nice warm home. You can set the temperature on the control dial according to your wishes. It radiates heat even long after you've turned it off saving on energy consumption. It will appeal to you with its silent operation, therefore, the unit is suitable for bedrooms or children's rooms, where it will not disturb anyone. The Sencor company places great emphasis on safety and is therefore equipped with a two-stage overheating protection. The 4 casters and a handle make the operation and transporting of the device easy. If you want to take it, for example, to the cottage you can easily remove the chassis with castors without tools. The rounded shape of the heating elements reduces the risk of children's injuries. For shipping to other EU countries visit this page Sencor SOH 3107BK. Chcete doručit zboží do Česka? Prohlédněte si Sencor SOH 3107BK. Chcete doručiť tovar na Slovensko? Prezrite si Sencor SOH 3107BK. Magyarországra történő kiszállításért tekintse meg ezt a termékoldalt: Sencor SOH 3107BK.